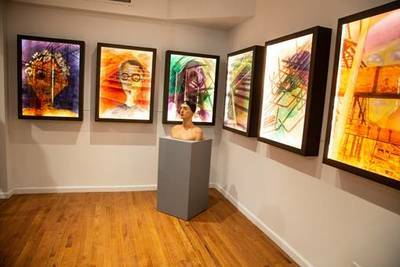 Artists, Ariela Wertheimer and Carole A. Feuerman, will install a site-specific public art installation and show to exhibit their work at Chashama Gallery om 14th street. The exhibit, presented by Tel Aviv based The Farkash Gallery in partnership with the nonprofit Chashama, supports both artists' mission of women supporting other women to enable incredible things to happen. Chashama supports artists by giving them space to create and present their work, while fostering community development through the arts. Wertheimer and Feuerman decided to join forces after meeting at the international art festival, La Biennale di Venezia in 2017. Wertheimer had owned one of Feuerman's sculptures from years ago and when they connected, they learned that their artworks are both inspired from a common theme– female empowerment. Wertheimer was awarded 'Best International Exhibitor' during her U.S. debut at Artexpo New York last month. Continuing to showcase her artwork, 'Jaffa Venice Light Boxes' the exhibit is an optic experience of a visual system, giving an onlooker a humane and personal connection that doesn't allow any room for indifference. The light boxes are twelve individual characters trapped between railings and each person is in their own small or large prison. Carole A. Feuerman is a pioneering hyperrealist sculptor being one of the three leaders that started the movement in the late seventies by making life-like sculptures that portrayed their models precisely. Feuerman's studio is one of the only studios that can produce these hyperrealist figures in a way suitable for the outdoors, allowing her intimate works to be installed in public spaces around the world. Through her sculptures, Feuerman tells stories of strength, survival, balance and the struggle achieve. Feuerman has spent the last four decades sculpting monumental, life-sized, and museum-sized works in bronze, resin, and marble. "I am very excited to be co-exhibiting with a fellow artist who is inspired by women and their personal experiences and stories," says artist, Ariela Wertheimer. "My artworks give expression to many issues such as homosexuality, domestic violence, sexual abuse, body image issues, and so forth. 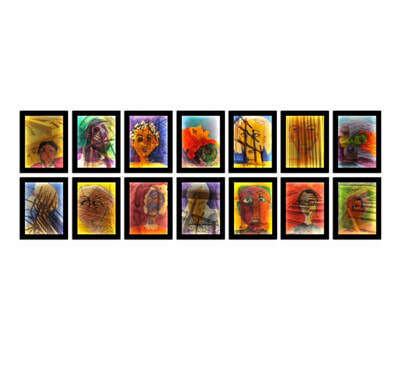 Through my work I show that a person has the right to decide how he or she is coping with his or her difficulty, and whether they decide to develop and grow from the difficulty into a strength, embracing the "bars", or remain in the same place. Within us is the power to allow ourselves to make a change in the space we have in our lives." Carole A. Feuerman is recognized as a pioneering figure in the world of hyperrealist sculpture. Together with Hanson and De Andrea, Feuerman is one of the three leaders that started the Hyperrealism movement in the late seventies by making sculptures portraying their models in a life-like manner. Dubbed 'the reigning doyenne of super-realism' by art historian John T. Spike, Feuerman has solidified her place in art history. 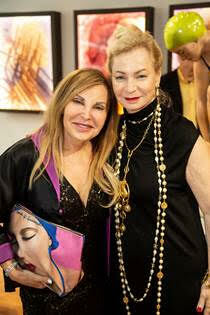 In 2011, she founded the Carole A. Feuerman Sculpture Foundation. From 2016 to 2017, she has had solo shows at C24 Gallery in New York, KM Fine Art in Los Angeles, Aria Gallery in Florence and London, the DeLand Museum of Art in DeLand, Florida, Lotte Palace Hotel in New York, and the National Hotel in Miami for Art Basel. Born in Israel, Ariela Wertheimer is highly-recognized artist specializing in various disciplines. Ariela first began her career in the medical field, having studied to be an X-Ray technician. Ariela then served in the Israeli Armed forces for twelve years. It is with this diverse background that Ariela finds inspiration for her work and creative techniques. Ariela began painting consistently, and showing her work in group exhibitions, in 1997. Eventually, Ariela moved from the suburbs to Tel Aviv, exposing her to an invigorating city life that provides her with the energy to create, photograph, and paint at an urban rhythm. Together, Ariela and her husband have five children. When she isn't creating new works, Ariela volunteers in the oncology department at the Rambam Hospital in Haifa.